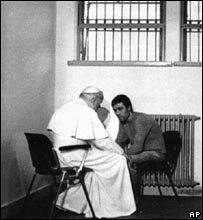 In a letter written from a Turkish prison, Mehmet Ali Agca, author of the failed attempt against Pope John Paul II in 1981, claims to have renounced Islam and embraced the Catholic faith. Italian weekly Diva e people donna published the letter, French journal 7s7 reports. "I am looking for an Italian woman, who wants to correspond with me. Obviously (I hope) she is Catholic because from May 13 2007, I decided to renounce the Muslim faith and becoming a member of the Roman Catholic Church," Agca writes. "I have decided to return peacefully to the (St Peter's) square and to testify to the world of my conversion to Catholicism," he says in the letter written in Italian. 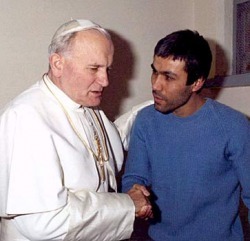 "Just for a day, I would wish to return to Rome to pray at the tomb of John Paul II to express my filial appreciation for his forgiveness," he adds. Questioned by AFP in Turkey, his former lawyer Mustafa Demirbag, said he was "very skeptical" about the conversion, given the steps required to receive baptism. Ali Agca also claimed to have expressed his desire to visit St Peter's Square to Pope Benedict XVI, without having received "no response to date". He also claimed to have informed the Vatican of his conversion. "For the Vatican, I may still be the man who tried to assassinate the Polish Pope, but now I have changed, I am a different man," he says.